Here at Red Candy we’ve been busy adding lots of lovely new products to our website, and we were particularly keen to get on board with the current wire trend. With sleek metal frames, minimalist designs and geometric shapes, we simply couldn’t resist these stylish offerings! Umbra in particular have released an exciting range of wire-style products – with that in mind, don’t forget that our competition to win an Umbra shopping spree on our website is still running! These bold but simple designs are perfect for adding a stunning contemporary and sculptural edge to your home, and will also make fabulous talking points. From multi photo frames to indoor planters and from fruit bowls to wine racks, if geometric, metallic or minimalist products float your boat then check out the selection below! These minimalist wall displays can hold anything from books to photo frames, and also include floating tumblers for small house plants. Inspired by Mondrian’s iconic cubist compositions, these metal wire compositions will create stunning feature pieces on any wall. Perfect for adding a geometric edge without having to commit to re-decorating the whole room! These wire fruit bowls are a winning combination of eye-catching design and effortless functionality – they come in gold, copper and white finishes. These wonderful 3D multi photo frames will create a stunning focal point in your home. Inspired by the grid-like Mondrian style, these gorgeous wire designs are unique ways of presenting your favourite photos or art prints for all to see! These brass and ceramic hanging caddies are multi-purpose storage solutions which will also create a gorgeous geometric feature in your home. Their symmetrical shapes make them perfect for creating a cool wall arrangement, which will be envied by all your visitors. They come in large and a set of 2 small. 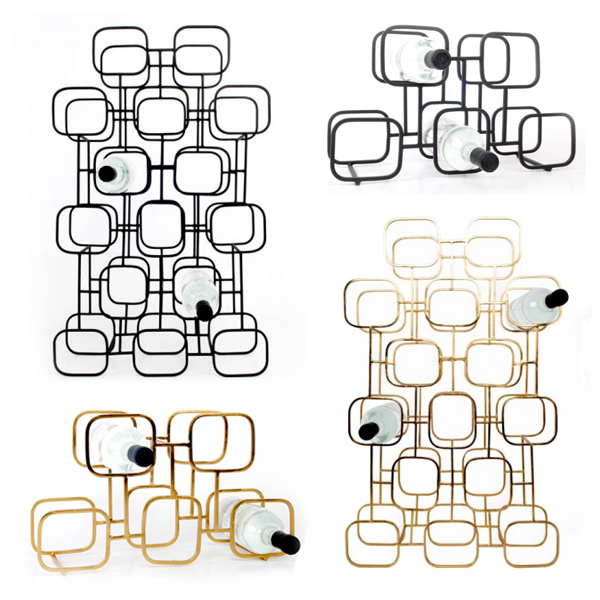 These wire wine racks are a stunningly unique storage solution for wine connoisseurs. With their unique coated metal frame and stripped-back design, these luxury racks are decidedly industrial in style. They come in two sizes and two finishes: matt black and brass. These designer displays are the perfect way to make your favourite snaps stand out, by adding a new dimension and architectural depth to the frames. These 3D wire prism constructions are made from brass, which is extremely en vogue at the moment! These stylish scarf holders are delightful designs which blend geometric form with stunning functionality. In a stylish brass or copper finish, these visually appealing organisers are brilliant storage solutions, which would look fantastic in any modern space.